Alert Protective Services is Chicago’s premier, locally owned and operated source for business security systems and home security systems. Since 1982, they have been providing outstanding service to thousands of Chicago-area homes, as well as, many local businesses. Alert Protective Services is solely Chicago based. APS’s owners and technicians all live within the Chicago land area, so customers have no need to worry about out-of-town-management or monitoring. APS will always be there when you need them. They provide a higher level of service to ensure your family’s safety, along with the safety of the community. Being family owned and operated, Alert Protective Services protects your family, as if they were protecting their own. The professionals at Alert Protective Services know what it takes to protect home in large metropolitan areas, as well as, smaller communities. Residents of Mount Prospect should feel at ease knowing that they will be provided with the same excellent 24 hours-a-day service and support, as all APS’s customers receive. Mount Prospect is city in both, the Elk Grove and Wheeling Townships. It is located 22 miles northwest of downtown Chicago in Cook County. The city has a population of 56,265 residents and 21,585 different households. Mount Prospect has a very diverse population and a median household income of $81,574. During the past decade, the number of crimes has slowing been rising. Last year, there was an average of 113 crimes committed per square mile in Mount Prospect. This is higher than the previous year. To get a better understanding of the type of crimes, we look to the 2009 statistics. There were a total of 1,170 crimes reported in the past year, 1,091 of which were property theft or burglaries. Only 79 out of the 1,170 were violent crimes. The chance of being victimized in a violent crime is 1 in 720. This is considerably lower than the chance of being a victim of a theft or burglary, 1 in 52. 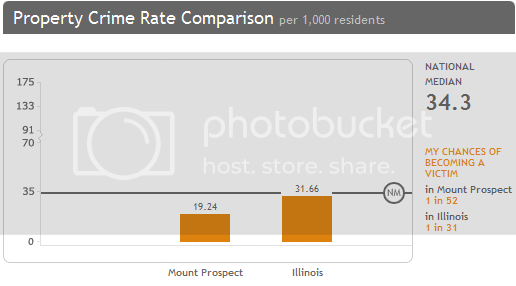 You can see that property theft and burglaries affect far more residents of Mount Prospect than violent crimes do and they occur far more often. Have a professional from APS come out and diagnose your home security needs and concerns. Our professionals have the knowledge and skills needed to fully secure your home. Security systems not only save lives, but they save money. Most homeowner insurance policies offer discounts to homes with security systems in place. In a recent study performed by the FBI it was discovered that homes with security systems in place are 15 times less likely to be burglarized. Alert Protective Services offers security system specifically developed to safeguard your family and your treasured heirlooms in your home or your business. Our systems will protect your office and home every day, 365 days of the year. As long as APS is protecting your home or business, there is no need to worry when you are on vacation or away from your office. Our professionals will craft a security system to meet your needs and more importantly, your budget. Call our offices today for a free estimate and additional information on our premium security systems.